The great mysteries of life are quite elusive. We do not have the "hard facts" needed to feel sure that our theories about the mysteries are true. Sometimes we feel sure, but convincing others is not so easy. Alas, they want "facts," and we cannot produce them. Well, times are changing. In 1994 I sent a letter to my friend, Madelon Rose Logue, which included various numbers that I had found in my dream-coincidence research path. Some of the numbers came from myths/religions, including the Bible, some came from reading about the crop circles, and most were involved in a "coincidence" I had experienced. Madelon sent a copy of my letter to Carl Munck, who then wrote to me. He informed me of a few things about the numbers, and enclosed two copies of his newsletter, The Code. This was itself a "coincidence," or synchronicity. I had just viewed the video of Richard Hoagland presenting his findings about the Monuments on Mars to the United Nations in 1992. In the video, Richard speaks of Carl Munck and his Code, and how it fits with the Mars findings. One of Carl's newsletters covered some basics of "The Code" system concerning the very precise positioning of the ancient sites. The other spoke of a related ancient numbering system called Gematria. I was awe struck by these things, as they seemed to "prove" mathematically that such a system did indeed exist, and most of the numbers I had mentioned in my letter to Madelon were part of the very ancient Gematrian system. The Code system is quite like the cartographic system we still use today . . . which was probably handed down to us from very ancient times. In both the old and new reckoning systems, the earth is divided into 360 degrees around the equator for longitude coordinates, and latitude coordinates are reckoned at 90 degrees, from the equator to either Pole. Each degree is further divided into 60 "minutes," and each minute is divided into 60 "seconds." Thus, by giving the degrees, minutes, and seconds of East or West longitude and same for the North or South latitude, we can "locate" any point on the earth, similar to the way we give two street addresses to locate a place in our cities and towns. The big difference between the two systems is that today we use Greenwich, England as the starting point (zero degrees), or "Prime Meridian," for the longitude coordinates, whereas the ancients used the Great Pyramid of Giza. The difference in longitude between the two Prime Meridians is 31 degrees, 08 minutes, 0.8 seconds, so this must be taken into account when calculating "The Code." It is not necessary to be a mathematical expert to learn The Code system. Some terms, such as Pi, the Radian (RAD), square root, 'e', and Tangent are mentioned as part of the decoding system, but a complete understanding of their meaning is not required to follow along. They are mostly various mathematical constants used in geometric calculations of circles and spheres. Brief explanations will be given in the articles that follow. To follow the calculations, it is most useful to have a scientific calculator. Windows 95 has a calculator under "Accessories" in the Start Menu. After calling up the Calculator window, it can be changed to a scientific calculator on the Menu bar under "View." Michael recommends using a pocket calculator with the needed functions on it, such as the TI-30Xa Solar, from Texas Instruments. It's also the one Carl uses. As a dream researcher, I was very interested to learn that decades ago, Carl had an incredible dream where he was taken back in time. He saw workers constructing the Great Pyramid at Giza. Other dreams and experiences were directing him to "figure out the pyramids." He did not understand or feel capable of doing such a thing, whatever it was, but it was like being bombarded by the Spirit to "DO IT!" This led to Carl's amazing findings. Carl has presented his research to many over the years. Unfortunately, from the academic world, all he has ever heard is "the sound of doors slamming." As we have seen in other fields, new ideas are often rejected out-of-hand without study and due consideration, especially when they have the potential to upset the apple-cart of accepted theories. We will present Carl's work on these pages, so that you can judge it for yourself. Michael will start by showing Carl's decoding of Stonehenge. It was Carl P. Munck's article on Stonehenge, in a newsletter put out by Richard C. Hoagland called "Martian Horizons" in the early 1990s, that really got me interested in Munck's work. Munck calls himself an archeocryptographer . . . and he is the pioneer in this new field, having re-discovered an amazingly-advanced "geomath matrix" from very deep antiquity, encoded in the precise latitude/longitude positions of ancient pyramids, mounds, effigies, monuments, and stone circles. Munck has been able to confirm the reality of this incredible discovery (or, re-discovery) by simply pointing-out what is *there* for all to observe, by way of modern satellite-accurate maps, simple math, and a hand-held calculator. Indeed; aerial photography, satellite imaging, and calculators (computers) have proven essential for the birth of archeocryptography. In his 'decoding' of Stonehenge, Munck first determined that the original Sarsen Circle was constructed of 60 stones . . . 30 uprights and 30 cross-pieces. The Sarsen Circle, like any circle, has 360 degrees of arc on its circumference if we assume "our" circle/sphere math conventions. Here was a major key in this re-discovery process: the hypothesis that 360 degrees on a circumference was 'always' an integral part of this advanced 'matrix'! Munck took the 60 original Sarsen Circle stones and multiplied them by 360 . . . 60 x 360 = 21600 . . . which "happens to be" the number of arc-minutes on any circumference, according to "our" math conventions. And, 21600 also "happens to be" the number of Nautical Miles on the polar circumference of Earth. Isn't it interesting that one Nautical Mile equals exactly one 'minute' of Earth latitude? Of course, we also "happen" to use the number 60 for "time circles" . . . minutes in an hour and seconds in a minute . . . as on the circumference of a clock face. We are finding out (re-discovering) that the numbers 60 and 360 are not *really* arbitrary, in terms of what we know as time and space. I think the number 60 is very "geometric" because it is divisible by many whole numbers into many *other* whole numbers, and this is part of the inherent "nature" of our number system. Munck calls the product of a site's (centered) degrees x minutes x seconds . . . the 'Grid Latitude' (or 'Grid Longitude' for the site's centered longitude). Now, if we multiply . . . 32 deg x 57 min x 28.8 sec . . . using the "numbers only" . . . we will be multiplying 32 x 57 x 28.8 . . . for a product of 52531.2. At this point, we look through the matrix to see if there is a figure "close to" 52531.2 . . . and we find such a figure in the number 52562.89164 . . . which turns out to encode the 'product' of certain math constants and a certain astronomical/geometric number, the multiplied product of . . .
Now, to "check" this figure . . . we start with 52562.89164 . . . and divide, first by the number of degrees, and then divide that result by the number of minutes, like this . . . In dealing with circles and spheres, we run into the math constants of Pi and RADIAN measure, and these constants are integral to this 'geomath matrix', along with the number 360. Pi is the ratio of circumference to diameter of any given circle or sphere. Radian (deg) is the arc-distance on the circumference that is equal to the radius of any given circle or sphere. In degrees of arc, the Radian is equal to 57.29577951 (deg) . . . to eight decimal places. It is an irrational number, like the Pi constant 3.141592654 . . . to nine decimal places. Now, back to the Grid Longitude of Stonehenge . . . Here we have 4 terms, or quantities, multiplying to a number that encodes the precise original (Giza-based) longitude of Stonehenge. And, each of these 4 terms are important "entities" that are integral to both the design and the essence of this re-discovered 'matrix'. Notice that the number 2160 is a "base-ten harmonic" of the number 21600, and vice-versa . . . the decimal point is simply moved one place, 'horizontally'. Note also that 2160 refers to: diameter of The Moon in statute miles (regular miles), years in a Zodiac Age, and the total number of corner-angle degrees on the surface of a Cube. Munck has determined that the precise (matrix-valid) radius in Feet, of the Sarsen Circle at Stonehenge, is 48.66934411 . . . to eight decimal places. If we divide that radius in Feet by Stonehenge's Grid Point Value, we get . . .
48.66934411 / 2.433467206 = 20 . . . a base-10 harmonic of the 'binary' number 2. Suppose we divide the Sarsen Circle radius in Feet into the RAD (deg) constant? Munck found that this number is the TANGENT of the precise azimuth-of-orientation of the 'Avenue' at Stonehenge . . . 49.65408598 degrees. He found further that 49.65408598 is equal to: (e / Pi) RAD . . . where 'e' is the base of the so-called "natural logarithms," observed in the 'growth patterns' of natural things such as conch shells . . . approximately the value 2.72 . . .
Stonehenge, of course, is a very important site in this re-discovered matrix. Next to only The Great Pyramid at Giza, it is apparently the most important site on Earth in the Geomath Matrix. (Lancaster, Pennsylvania) in 1973 with a B.A. degree in English Literature. and culture. He is an archeocryptographer and an alpha-numerologist. or phone him at 412-921-9116 in Pittsburgh, PA. Some readers may be familiar with the Greek system of Gematria, or others, which have numbers such as 666, 777 and 888. Carl Munck first encountered the word "Gematria" around 1986. When he tried to find information about Gematria, he found that the word was not in the dictionary, and that the libraries and book stores had nothing about it. Several years later he met a "genuine shaman of Gematria - code name HannaH," who virtually buried Carl with Gematrian materials. The Gematria explained by HannaH's material is not the same system used by the Ancient Greeks, or other familiar systems. The Gematrian numbers all are divisible by nine and add to nine or a multiple. Carl noted that the basic numbers always end in 0, 2, 4, 6, or 8. A Forgotten or Repressed Science? Carl asked in his newsletter (Volume 3, Nr. 6, June 1994), "Is Gematria one of those fragmentary ancient sciences which the longer we probe, the less we understand?" He went on to say, "Academia would just as soon be rid of it for that very reason. Yet, we have an enormous body of evidence to indicate that the ancient Greeks, Egyptians, Persians, Babylonians and Romans were enormously involved with these very same numbers, many of which even found their way into their metrological systems thereby becoming units of weights and measures." The 5th Century B.C. trading empire of the Eastern Mediterranean Phoenicians saw the appearance of a writing mode in which alphabetical letters served as numbers. Even at this early date, however, its roots were lost in the mists of time. From this base evolved the Hebraic and later Greek systems of Gematria. Both had reached a high degree of development by the 3rd Century B.C. These alpha-numeric alphabets exhibited qualities and inter-relationships for which there is no logical intention. Yet an entire symbolic teaching evolved around them which incorporated the principles of number, form, sound and astronomy. Only number combinations and figures could be utilized to express this knowledge. Today, we view numbers as merely an expression of quantity. To the ancients, every number had its own character and identity; a place in an arithmetic chain that leads from one dimension of understanding to another. This extraordinary system of arithmetic, or concealed geometry, form the link between the languages of literature and mathematics. With this knowledge, ancient literature, metrology and Sacred Geometry can be viewed with new eyes. With numbers, alphabetical cryptography becomes the law. Biblical numbers and structure dimensions become alphabetical statements. The WORD (number) becomes FLESH (dimensional) for numbers are words. In ancient Babylonia, a long unit of measure called the "Kasbu" was well known. It was 129600 "Susi" in length. 129600 is the square of 360, and in the global matrix, the same figure which was used to encode the West Giza Longitude of the Shark Mound on North Bimini Island. Also in Babylonian metrology was the "Maneh," a unit for measuring volume. It was equivalent to 7776 cubic inches by modern reckoning, but to them, 21600 "Um." 21600 is the grid latitude of Stonehenge! Is this only coincidence? After all, at the time Babylonia was great, Stonehenge hadn't yet been built - at least where our dating of the site is concerned, a date which could be WAY off the mark. A long unit of measure used by the ancient Egyptians was the "Schoenus," a unit of 216000 modern inches. The same figure finds the longitude of the Octagon at Newark, Ohio. Did they know that? The Roman "Load" was 3000 Libra; 2160 pounds today. 2160, the grid latitude of Newark's Observatory Circle. More coincidence? The earliest recorded bushel was equal to 2160 cubic inches. Over time, the ancient Egyptians employed several "cubits" in their body of metrology. Among them was the so-called "Royal cubit" - 20.67 modern English inches. 20.67; the actual longitude of the Mycerinus Pyramid to the West of the Great Pyramid. In ancient Persia, a "talent" of gold was equal to 388800 grains. 388800 is what happens - exactly what happens - when we multiply MY-2 (7.396853329) by 52,562.89164, the grid longitude of Stonehenge. Who told them about that? Carl suspected that formal ancient metrology was rooted in the even more ancient pyramid codex. He went on to read into the subject, including the works of Charles Warren, and A. E. Berriman. Most of the authorities agreed that no one knew where ancient metrology came from - it was already in use when men first began writing. "Obviously," Carl said, "it is incredibly ancient." 288 = Double light, the Kingdom of Heaven. 432 = Consecration (also the square root of the classical speed of light, 186624 miles per second). Several Biblical references are also tied to it; Luke 8:15, Revelation 2:17, etc. 396 = Classical earth radius (3960 miles). 576 = Prophecy and Gospel. 864 = Time (2) the source of light and life, (3) Most Holy. 1152 = Witness (576 x 2). Biblical references include Luke 14:26, Revelation 3:12, 12:11 and 19:9. 1296 = Circle of space (360 x 60 x 60). 1296 was also Plato's favorite number. 1548 = Priest of God. 1728 = A-flat in music. 2304 = False Christs and False prophets (1 Cor. 14:22, Mark 13:12). 3168 = Lord Jesus Christ. 3888 = New Jerusalem (Rev. 21:2, 1 Cor. 12:27, Luke 8:21, etc.). 5184 = Victory over the beast (Rev. 15:2). Carl explained that although this is quite confusing to the layman, even when the Biblical references are consulted, "the shamen of these sacred numbers are convinced that certain passages in Holy Scripture actually represent a codex in their own right, wherein certain communications from ancient men of wisdom were very carefully positioned in the Bible in order to secretly transmit vital information across time itself - not unlike what we are seeing in the pyramid codex." Surprisingly, many of the Roman numbers are the same as those used in the Gematrian system. Since metrology came before written records, and was likely handed down to the Romans, the number system came LONG before the Bible. Some give other figures for the various Mayan time periods, but the numbers are also Gematrian or Gematrian-related. I do not know the source of Carl's listing above. Two days ago, Michael sent the "correct" Mayan time periods and how the numbers 'work properly with' the Gematrian numbers. He suggested that I replace the old ones with the corrected version. For the time being, I want to leave the old ones, because they are from Carl's newsletter, which is being reviewed in the above writing. The following is Michael's "correction," as he understands it at this point. 1 KIN = 1 Day or 24 hours = 144 "Mayan Minutes"
20 KIN = 1 UINAL = 1 Haab Calendar Month of 20 Days = 2880 "Mayan Minutes"
18 UINAL = 1 TUN = 1 Haab Calendar Year of 360 Days = 51840 "Mayan Minutes"
On The Tzolkin Calendar, the cycle is 260 KIN (days), composed of 20 'wavespells' (see Jose Arguelles, et al) of 13 KIN (days) each. So; there are 13 'tones of creation' . . . 13 KIN . . . in each of the 20 'wavespells'. Each 'wavespell' is represented by a Mayan Glyph symbol. A half-day, or one-half KIN, is 12 hours. We could think of this as "daytime" and "nighttime". Then, each 'daytime' and each 'nighttime' can be split into two 6-hour intervals. Each 6-hour interval is equal to 36 "Mayan Minutes", which gives us a basic "gematrian" unit of 36 "Mayan Minutes". As Carl P. Munck shows in his work, these 'intervals of 36' can be plotted as two separate sine waves according to the two common tangents (plus and minus) of gematrian numbers. Since these number systems were in place long before the arrival of Columbus in the West, the mystery thickens. Carl suggests that the ancient people held the numbers to be of vital importance, and thus placed them in their metrology and calendars in order to preserve them in the best way they could. The numbers were there, before the beginning of writing. The people who recorded the numbers via their special systems, probably did not know what the numbers really meant. In the newsletter, Carl had a longer list of these numbers in vertical columns. He also drew in sine waves connecting the numbers, which seemed to be suggested by their logic. He noted the consistent differences between the various numbers in the top two rows of 36 and 144, such as 108 - 72 = 36 and 252 - 108 = 144. The differences between the bottom rows are 108 and 72, such as 144 - 36 = 108; and 216 - 144 = 72. He knew that 2.236067977 is THE SQUARE ROOT OF FIVE!!! That's the pyramid codex talking! ", Carl says. He asks, "Why does the square root of five answer the sine waves of the Sacred Numbers? What was the reasoning behind it?" "Because the square root of five is ITSELF a Tangent; the Tangent of 186234.09485." Which is the SPEED OF LIGHT IN AIR!!! "And there we have it, the reasoning behind the Sacred Numbers of Gematria, the same ones preserved in eastern metrology and western calendrical computing; square roots and tangents - all keyed to the terrestrial speed of light - AND DELIVERED THROUGH THE PYRAMID CODEX IN NEARLY THE EXACT METHODOLOGY THEY USED IN KEYING THE EARTH'S EQUATORIAL CIRCUMFERENCE TO THE CUBE ROOT OF DOUBLE-PI when they built the Great Pyramid at Giza." "No communications across ancient oceans? No prehistoric writing that makes any sense? Ignorant stone age progenitors? I'm afraid I'm not buying anymore, not when I can so easily find this kind of mathematical evidence to the contrary." "Someone back there had it all; maps of enviable accuracy, a complete knowledge of every inch of our planet, a thorough understanding of mathematics and, yes, even calculators and computers we take for granted today - because without such tools, they could never have put it all together. Why do I say that? Because the U.S. Geological Survey advises me that they have the only computer in the United States which is programmed to calculate accurate distances between widely separated points anywhere on the planet - which means - that before the ancients could have marked out the pyramid grid system, they required a computer of the same caliber!!" Press the "Memory Store" key to store this number. Press the "x" (multiply) key, then press the Memory Restore key, then the "=" (Equals) key. The result should be 2.236067978 (the result of 0.726542528 x 3.077683537). Now, press the "C" (Clear) key, then enter the number 5. Press the Square Root key, to display the square root of five, which should be 2.236067978, the same number you arrived at by multiplying the tangents of 36 and 72. Again, there are only four tangents, and just two tangents when the plus (+) and minus (-) signs are ignored. Since it is unlikely that the ancients had modern calculators or computers, Carl wondered just how they were able to consistently use numbers that had only the two tangents. Reading Carl's work was staggering to me - it felt like my head was reeling! I'm sure this would have been the case even if I had not experienced all the "coincidences" about such numbers . . . but read on, to grasp how all this fit in with my own findings. "The significance of this number, in arithmetic, cosmology, ancient theology and temple architecture was first explored in City of Revelation (1972) and is summed up in a section of The Dimensions of Paradise (Thames & Hudson, 1988). In traditional cosmology, 31680 miles was taken to be the measure around the sub-lunary world, and the early Christian scholars calculated the number 3168 as emblematic of Lord Jesus Christ. The same number was previously applied to the name of a leading principle in the pagan religion." I tried some calculations in an attempt to figure out "31680." I tried assigning the number 8 to the North sun symbol, and 9 to the moon symbol at the southwest corner of the triangle, and multiplied to get 72, which are the number of Divine Names used as codes in Creation according to Dr. J. J. Hurtak, author of The Book of Knowledge, The Keys of Enoch. To arrive at the number 31680, I needed to assign the number 440 to the ratchet (Mercury) spiral glyph on the southeast corner of the crop formation (8 x 9 = 72 x 440 = 31680). It struck me that 440 yards is a quarter mile, so I tried dividing 31680 by 5280, feet in a mile, to find it was exactly 6 miles. At the time, I wondered how ancient people could use one of our "modern" measurement numbers. Little did I know! Interestingly, a relative informed me later that 440 is the cycles per second of the musical note of "A." Back around 1992, a strange thing happened. One night at work the numbers 72 and 360 kept coming into my mind over and over. I knew about the 72 Divine Names, and I had read that 360 was called a "Prophetic Year," by certain proponents of the Bible. It is part of an interpretation concerning the dream of Nebuchadnezzar in the Book of Daniel. He dreamed that a great tree was cut and banded, which caused a period of insanity for seven years. This is calculated as Prophetic Years, giving 7 x 360 = 2520 years. From the fall of the Temple at Jerusalem, this is said to give the year 1914 as the beginning of the Apocalypse (The year 1914 seems to be off a bit). I finally stopped and multiplied the numbers coming into my head. 72 x 360 = 25920. I was startled, because I knew this was the number of years of the precession, caused by the "wobble" of the earth's axis, giving us our 12 Zodiac Ages of 2160 years each. I had read about the precession number in Joseph Campbell's, The Inner Reaches of Outer Space back in 1990. It was mentioned that when the precession number is divided by the ancient number 60, called "Soss," the result is 432, which is a cycle of time number (Consecration in Gematrian). Apparently the ancients knew about the precession long ago. In 1992 and 1993, I had some strange dream-coincidences which eventually became centered on Revelation 11:11. The verse includes the words, "three and a half days." At one point, I re-read some dreams I had received, and two of them made a connection. In one of them a voice said, "The children were born in the sign of 42." In the other dream, I saw "Trinity 11:2." I looked up Revelation 11:2, and found that it speaks of the holy city being trampled over for 42 months. I then realized 42 months is is 3 1/2 years, perhaps connecting with the 3 1/2 days in Rev. 11:11. I then read the next verse, Rev. 11:3, which speaks of 1260 days. This was not quite 3 1/2 years, but dividing 1260 by 3.5 gives 360. It's like 3 1/2 times around a circle, again matching the 3 1/2 in the other verses. At the time, I did not know that the Hebrew calendar had 30-day months, but I now see that 1260 days is another way of indicating 3 1/2 years. In Joseph Campbell's book, he gave the number of years from Adam's creation to the time Noah's Ark landed on the mountain, as 1656. The number of weeks in that period of years is 86400, it is figured. A human heart, beating once a second, gives the same number, 86400, in one day (60 x 60 x 24). Dividing the number in half gives 43200, strongly suggesting the ancient cycle of time number. The number 108 is the number of names of the Mother Goddess in India, and figures in the time cycle number as 108 x 4 = 432. I had written about these subjects and others in my letter to Madelon, which she passed on to Carl. As you can see, many of the numbers are the same or similar to those in Carl's work. I noticed that Carl had the number 1656 listed in his "sine wave" type illustration (I stopped short of it in my rendition above). But it was apparently a "fill in the blank" type number, as it had no asterisk indicating that it was used by the ancients. The number 1260 was not listed anywhere, yet it seemed to me that it should fit somehow. Some months after learning of Carl's work, I had a dream of a circle divided into parts, and I knew it was about the Gematrian system. It came out to a 360 degree circle, or "Wheel," divided into 10 parts of 36 degrees each, giving the sequence - 36, 72, 108, 144, etc. Full revolutions produce the same numbers with factors of ten - 360, 720, 1080, 1440, etc. The pattern keeps repeating on a base-ten system, so, for example, 144,000 is 400 times around the "Wheel." Each section is divided into 6 parts, for a total of 60 marks. The top and bottom points of the "Wheel" have a zero tangent. The other eight points have the same four tangents listed by Carl, two if you do not consider plus and minus signs. The Bythorn Mandala crop formation of 1993 had a ten petal lotus with a five-pointed star inside. It may hint at the Gematrian system by the ten petals, and the star, which has 36 degrees in each point, and 72 degrees between points. The design is very similar to a yantra to the Goddess, Kali (one of 108 aspects of Sakti) of the eastern religions. Two of the points of the star were facing toward the North. In esoteric traditions, such a star with two points (or horns) up, signify the Kali-Yuga time cycle, called the Age of Iron, which we are now in. This is said by some to be 432,000 years. Interestingly, Daniel's interpretation of Nebuchadnezzar's dream of the frightening image, was that it represented the Ages, symbolized by the metals, gold, silver, bronze, and iron, followed by the iron and clay mix in the feet of the image. The Hindu chronology has the same four metals in the same order. Some other significant numbers are located at "in-between" points on the "Gematrian Wheel." It could be considered a 20-part Wheel. Each of these points are 18 degrees between the Gematrian numbers, such as 18, 54, 90, 126, 162, 198, and 234. Notice that 54, 126, and 234 all have the same tangent (again, ignoring plus/minus). Check this against the number 666, to see it has the same tangent. 666 is one of the '"in-between" points, being between 648 and 684 on the "Gematrian Wheel." Notice too, that some of these numbers rearranged, and with various zeros, form regular Gematrian numbers. For example, add a zero to 126 to get 1260, or insert a zero into 234 for 2304. Notice also that the "in-between" numbers also add to nine or a multiple of nine, and are divisible by nine. The numbers often show a repositioning, such as 432 and the reverse, 234 (an in-between point), and 324. Such is the odd nature of Gematrian and Gematrian-related numbers. Other related numbers can be put on a six-part wheel, of 60 degrees per segment, giving the sequence 60, 120, 180, 240, 300, etc. Various designs, such as the Star of David, fit with this "Wheel." Remember that Joseph Campbell pointed out that 60 was an important number called, "Soss," by the ancients, who used it in various calculations, as we do today with our time-keeping and coordinate system. Remember too, that 31680 divided by 6 results in 5280, feet in a mile. Carl points out that these numbers were also used by the ancients, and the tangents are the square root of three (again, excluding the top and bottom marks). The number 88, which sometimes appears in dreams, may be something of a "connecting" number between the two "Wheels," as 88 x 60 = 5280 and 88 x 360 = 31680. For my part of this article, I will speak of the various numbers in terms of the "Wheels," explained above. If a number fits on the ten-part "Gematrian Wheel," meaning it is evenly divisible by 36, I will term it a Gematrian number. But, keep in mind that this is just my personal convention. Others may not consider certain numbers, such as 1260, as being Gematrian. If a number, such as 666, fits on the 20-Part Wheel, but not on the 10-Part Gematrian Wheel, I consider it Gematria-related, as being an "in-between point" on the Gematrian Wheel. If an established convention existed, I would use it instead of my personal system, but such a convention is not available at this point. At a later time, I will present a possible 12-Part Wheel. Keep in mind, as you read on, that when a number is listed that ends with an even number, and adds to nine or a multiple of nine, it may be a Gematrian number. If it divides evenly by 36, then it is one of the Gematrian numbers in my system. You can also verify it by entering the number on your calculator, and checking to see that the tangent is equal to 0.726542528 or 3.077683537. The tangents are both positive and negative numbers, but we will ignore that, for the most part, in our study of The Code. The above is true when the ending number is 2, 4, 6, or 8. Some Gematrian numbers end in a zero, such as 1260. Larger Gematrian numbers that end in zero, such as 1080, also have a zero tangent, but you can still check it by removing the final zero or zeros, and checking the tangent. For the number 1080, remove the zero and check the tangent of 108 to see it is -3.077683537. Taking the Stonehenge latitude number, 21600, as another example - take off the ending zeros and check the tangent of 216, to see that it is 0.726542528. Some Gematrian numbers have other special attributes to them, which we will point out on these pages. An example is 216, which is 6 cubed, or 6 x 6 x 6. As Michael mentioned, 2160 is the diameter in miles of the Moon, and 2160 is the number of years in one Zodiac Age. Another example is 1296. It is six to the fourth power (6 x 6 x 6 x 6). Its base-ten harmonic, 12960, is the number of years in half the precession (25920 / 2). As you see, the numbers are related. The twelve Zodiac Ages of 2160 years each, total 25920 years, for one grand circuit of 360 degrees. The great accuracy of The Code holds true only with the latest satellite mapping coordinates. Carl says the plates of the earth have shifted a bit since some of the sites were built. Since, "The Code" shows accuracy within yards, the question is, "How did the ancients know how to do this." He thinks it is like a time-capsule, because it could have never been figured it out until now. Many years ago, the ancient sites were not located at the same coordinates where we find them today; so, whoever devised "The Code" must have known where the sites would be located in the future. The researchers also say that the ancient sites are located at crossing points of dowsable "ley lines," and that the crop formations also appear on these points. Experienced dowsers have found that earth-energy within various crop formations form geometric patterns, such as stars and cross-like shapes. In one case, a pattern similar to The New Jerusalem Plan, based on the vision of Saint John in Revelation 21, was detected in a crop formation. The same pattern has been "dowsed" within certain ancient sites, such as Stonehenge and Avebury. I had a powerful lucid dream that lead me to research alien life and sacred sites and especially an Earth Grid of sacred sites. The dream also gave me the info on where to look and a strange set of music wheels, which later turned out to be a most important piece of the puzzle. I met a man named Richard Hoagland in Los Angeles and I showed him one of the music wheels. He in turn gave me the phone number of a man named Carl Munck! Well, the rest is history, or should I say ancient history. Several years ago, I read a book about Greek Gematria called Jesus Christ, Sun of God, by David Fideler. He explains where the Biblical story about the 153 fish in the net (John 21) came from. As a source, he refers to John Michell's City of Revelation. The story was taken from prior Greek works, which demonstrated names and numbers which were crafted to reflect geometrical diagrams with cosmological significance. The Greek words for "FISHES" and "THE NET" both equate in Greek Gematria to the number 1224, and 153 is 1/8 of this amount. In the Biblical story, then, Simon and his other six fishermen correspond to a circle with six interlocking rings with a central circle inside. This also forms an six-petal flower-like shape inside the central circle, like "The Flower of Life." As the story continues, more geometric shapes are added, one of which is a grid of diamond shapes forming a larger diamond. This is the "NET" in the story. A vertical measurement is 153 and the horizontal is 265. This demonstrates a number very close to the square root of three by 265 / 153. D# = 152.89924 cycles per second, the augmented 4th from its root "A." This interval was outlawed a few hundred years ago. Divide by pi = the radius of the inner circle of Stonehenge. Multiplied by pi = height of the Great Pyramid. Notice that 153 and 1224 add to nine and are divisible by nine. Also note that 306 (2 x 153) is an "in-between/666 tangent" number, and that 612 (4 x 153) is a regular Gematrian number (evenly divisible by 36), as is 1224. Remember too, that 612 was one of Carl's "sine wave" numbers - not part of the ancient systems he had found, but a "fill-in" number to complete the order of the sine waves. 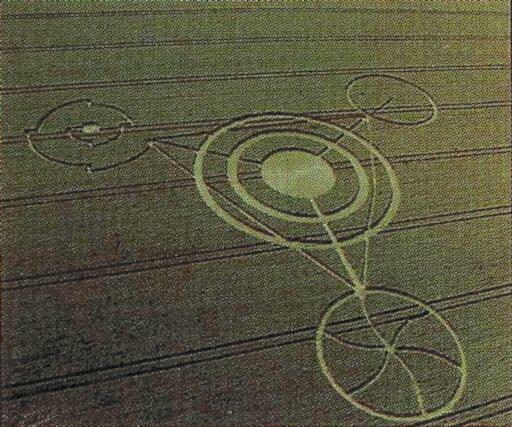 In 1997 an article appeared in a crop circle journal, written by two German researchers. By measuring and analyzing the various distances of the crop circle formations, they discovered that ancient numbers were revealed. They did not use the term "Gematrian," but the numbers are basically the same. Other crop circle researchers have noted the significance of the number nine in the crop formations. Nine and multiples of nine show up in dimensions, angles and distances between crop formations and various sites. Carl Munck has written a few articles about the crop circles and possible Code connections. I have found a number of connections, other than the ones noted in the above article. A notable connection was the Double-Helix/DNA Formation of 1996, which was 648 feet in length. For a number of years the Mayan Daykeeper, Hunbatz Men, has been speaking about great earth changes coming. He said the prophecies indicate that the changes involve a "DNA repair." He has been involved in "activating" the ancient sites, as part of this process. While searching the internet for information about various the subjects in these articles, I found a page that speaks of Crop Circles and Mayan Time. In 1997 a "Grid" crop formation appeared, which may be related to the Mayan system. An article was written about it called, The Strange Attractor Crop Formation and the End of Time. We will be presenting all this information on these pages in the weeks and months ahead. Update: Our first article about the crop circle connections is now included in this series, as Part Seven (see Index below). We began a communication with Gary Val Tenuta in August 1998. Gary is learning about The Code and the Gematria number system, but he has extensive experience in working with numbers and codes. Some of his work involves our own English alphabet, which also seems to have a code within it. My partner, Dee Finney, has been involved in our discussion and research of numbers since 1997. She has been quite helpful in presenting these pages in various ways. Equally 'impossible' - at any rate for a people like the ancient Egyptians who are supposed to have known nothing about the true shape and size of our planet - is the relationship, in a scale of 1 : 43,200, that exists between the dimensions of the Pyramid and the dimensions of the earth. Setting aside for the moment the question of whether we are dealing with coincidence here, it is a simple fact, verifiable on any pocket calculator, that if you take the monument's original height (481.3949 feet) and multiply it by 43,200 you get a quotient of 3938.685 miles. This is an underestimate by just 11 miles of the true figure for the polar radius of the earth (3949 miles) worked out by the best modern methods. Likewise, if you take the monument's perimeter at the base (3023.16 feet) and multiply this figure by 43,200 then you get 24,734.94 miles - a result that is within 170 miles of the true equatorial circumference of the earth (24,902 miles). Moreover, although 170 miles sounds quite a lot, it amounts, in relation to the earth's total circumference, to a minus-error of only three quarters of a single per cent." This is the first update of this page since July 2, 2001. Many things have changed over these three years. Our original group of "Code" broke up, in that we seldom exchange information as we did in the past. There is still some communication, and various other interested individuals have shared information about number systems and related matters. William (Bill) has found that there is a code within the New Testament wherein letters of the English language are designed to be read as numbers. He also demonstrates how various numbers are associated with certain geometric shapes, such as triangles and snowflake fractal designs. Minor changes to the text of this article were made. All links were checked and dead links were deleted. Extra hyperlinks were added. A controversy started years ago that relates to these pages -- specifically the articles by Michael Morton. I learned second-hand that Carl Munck was critical of Michael's coding methods. I gathered that Michael was skipping one of the first steps most of the time. That step involves developing a set of numbers based on the geometry of the specific ancient site. In the Stonehenge example above, the set of numbers are 60 stones in a 360 degree circle, indicating 60 x 360 = 21600. I did not want to be the "judge" of the argument, so I did not make any related changes to this site. For the time being, Michael's writings will remain as is, but keep in mind that they fall short according to Carl. I may remove Michael's writings in the future. Ohio's Serpent Mound, Python of Pythagoras? Miami - Home of the Mayans? Vibration Rates for Creation and Destruction! From: "Healing Codes for the Biological Apocalypse"